Is a very useful utility, it enables any iPhone user to customize their iPhone ringtones with this program you do not need any "jailbreak" for your iphone. You can customize ringtones with a variety of functions supported by iRinger. It is compatible with all versions of Microsoft Windows, including Windows Vista. iTunes 7.5 software or later, also works with the new iPhone 3G. 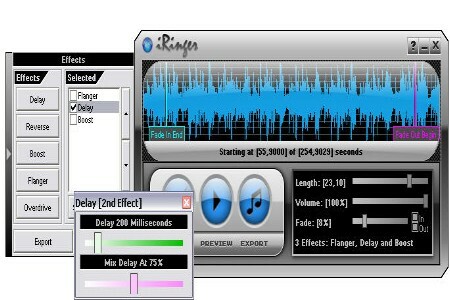 ToneShop: Free iPhone ringtones maker forWindows. Using ToneShop you can create ringtones in MP3, WAV and AAC formats. The Apple iPhone M4R (AAC) format is the latest addition to it. ToneShop compatible with Windows 2000, XP and Vista PCs (32 bit and 64 bit). ImTOO: Mac iPhone Ringtone Converter Maker. is a smart iPhone ringtone creator you can use it create iPhone ringtones from video or music and transfer it to iPhone directly. This Mac iPhone ringtone maker software supports converting All popular video or audios including : AVI, MPEG, WMV, DivX, MP4, H.264/AVC, MKV, RM, MOV, MP3, WMA, WAV, RA, M4A, AAC, AC3, OGG.